CZT 6 workshop: 4 days and counting! I am excited, intimidated, nervous, thrilled. I am an artist, but compared to some art I see, my pen is uninspiring. I embrace me, but sometimes the muse shouts, not whispers, nasty things in my ears. Ah, ’tis the same with writing and so many things how often we doubt ourselves. I don’t know what I expect from this workshop, but I can’t wait. Just in time for that is a new tangle: Oof. That’s the Diva’s weekly challenge, her 21st challenge. Where has this year gone?? Oof. Inspired by the Cloisters. This tangle is not my taste. Too ornate, perhaps? Formal? Maybe it’s because, despite THON, I can’t draw a diamond. Oof is on the left from this angle. This was my second attempt, the first just practice. I drew squares here and connected them per tangle instructions. I lost interest, and I lost my place, so I stopped about three-quarters of the way through. I rather like this. It’s an interesting twist on the original; more simple, not so regal or rigid. 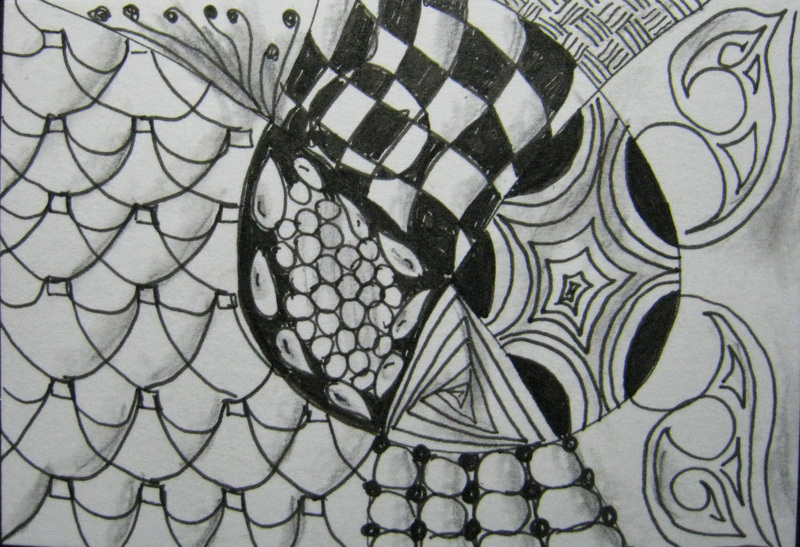 That’s the beauty of Zentangle: personal interpretation. And that’s what I hope to learn. Previous Di’s WordsOfWisdom for May 7 Next Di’s WordsOfWisdom for May 11…found!! Well, your personal interpretation came out great – nice tangle! I think you got it very well. And you will have a great time at the CZT seminar – I attended last October – aside from being the best art experience it was one of the best life experiences I’ve had. Very nice twist on OoF. Have fun at the CZT workshop! I’ve looked at other Oofs from others in the challenge, and I’m inspired to try it again, to play with it more. I am SO looking forward to the workshop. I know it will stretch me as an artist and an observer and an everything else. I can’t wait to explore this. Subscribe here--you know you want to! My coolest posts, voted by you!